It's our MISSION to stand up for our rights and for people who can’t stand up for themselves; To work together to teach our communities about what great citizens, people with developmental disabilities can be. It's our VISION to be a people with developmental disabilities, who are active, contributing citizens and leaders. We are proud to be disabled and we are proud of who we are. Through mutual support of members and other people with developmental disabilities who need help to stand up for themselves. By working with other community groups, disability rights groups, or human rights group to educate on disability issues, disability culture, pride and citizenship. Assisting in community development projects that create inclusive, welcome communities for all citizens including people with developmental disabilities. 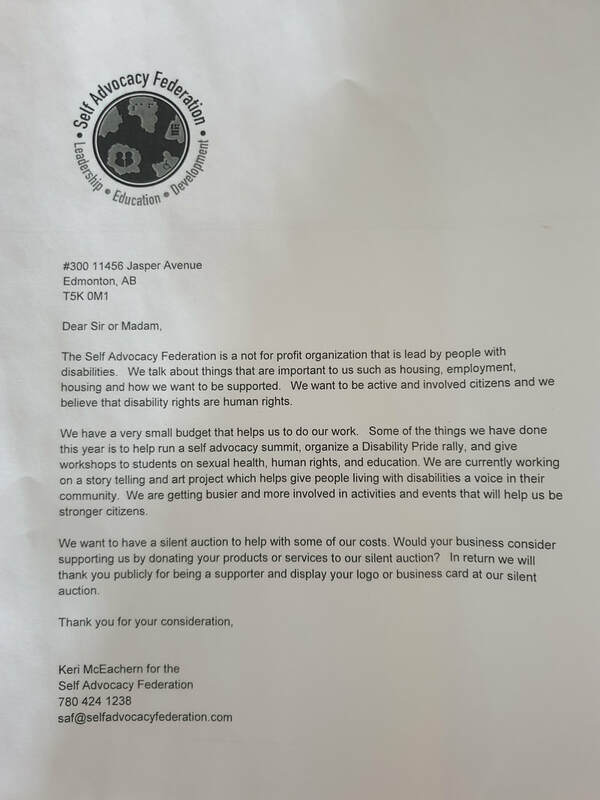 The Self Advocacy Federation is planning to hold an online silent auction and we need your help! If you, or your organization, is interested in donating items to us for our silent auction please e-mail us at saf@selfadvocacyfederation.com or by phone at (780) 424-1238. We thank you in advance for your support!